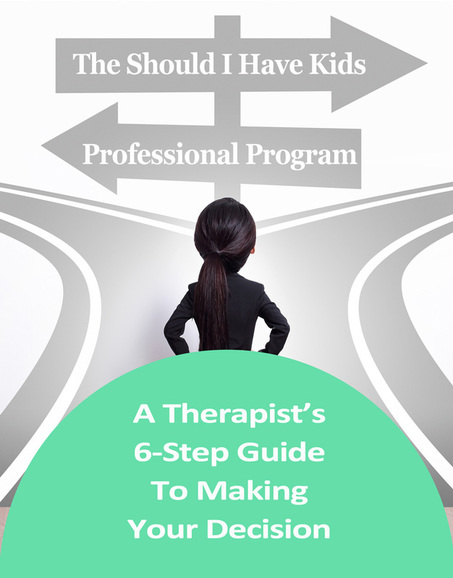 Self Help Program: Should I Have Kids Or Not - Kids or Not? A professional program you can work through in your own time & at your own pace. Information, exercises & advice that will make it clearer & easier for you to reach your decision. A therapist's program that is equivalent to at least 7 counseling sessions. A step-by-step guide to figuring out the best path & timing for you. Help with working through your difficult thoughts & feelings. Read a Free Sample of the Program! Do you want help to discover if, and when, you should have kids? Keep reading below to find out more about the Program and its 6 steps! 1. Figuring out who you are and what you want for your life; is it more aligned with parenthood (and if so, when is the best timing), or a childfree future. 2. Exploring how a child might change different aspects of your life; and looking at your willingness and readiness for these changes. 5. How to make your decision. 6. Moving forward with a plan and with peace and confidence in your decision. Throughout the program you will explore the root causes of your indecision and the aspects that may be complicating your decision such as problematic motivating reasons, fears, beliefs & expectations, and work through any necessary issues. You will learn more about yourself and what you really want for your life and whether having kids is part of that ideal life. Will parenthood bring you the greatest fulfillment and joy or is a childfree life the best future path for you? The equivalent of at least 7 counseling sessions worth of information, exercises and guidance - you can do this program from the comfort and privacy of your own home, and work through it at your own pace. You will have 24/7 access to the online program via your own secure log in. Many people also find that this program, and going through the general kids or not decision, ends up improving how they look at their lives and at themselves because it requires you to really identify who you are, what you value in life, and what gives your life meaning. So, you might find there is an added bonus to going through all this: That no matter which choice you make you will move forward with greater wisdom, strength, meaning, happiness and fulfillment in your life. It really is worth putting in the time and effort to work out the best future path for you so that you limit the possibility of future regrets & doubts, and increase the likelihood of life satisfaction and joy. Please Note: The program is only available online (not for download) so you will need an internet connection to work through the program. For further information please see my Frequently Asked Questions.